Share the day with friends and family. Eat a healthy veggie feast. Play football out on the lawn. Thanksgiving has become our family’s favorite holiday–ranking higher than even Christmas with our kids (that’s saying something). Watch the Parade Thanksgiving is all about rituals. The first ritual in our house is to get a TV into the kitchen. We are one of those families that has rules about TV…no TV’s in your room, and if we are going to watch TV then we need to watch it together as a family. But there is one exception…on Thanksgiving morning I must watch the Macys’ Thanksgiving Day Parade while I cook. So my husband crawls under the house, finds an old TV and hooks it up with an antenna in the kitchen so I can see every moment of the parade while I am prepping our Vegetarian Feast. As the kids “oooh and ahhh” in the living room, I can see the floats and balloons that are catching their attention. I often run into the living room to see the parade on the big screen. Veggie Turkey ready to go in the oven. Make a “Veggie Turkey” with your kids! It is much simpler and more fun when you do not have to cook for hours in the kitchen. There is more time for the family playing together. First we visit our local organic foods store and buy two “veggie turkey roasts”. I have found that Quorn is the easiest to prep and has the best taste–it is our “white meat” for our feast. Along with it we buy wheat gluten Seiten for our “dark meat” (now I know true vegetarians are not supposed to think meat at all, but in our case it works.) We also buy fresh and dried cranberries, asparagus, almonds, onions, carrots, potatoes, and meat free stuffing mix–check the labels, many have chicken stock in the mix. 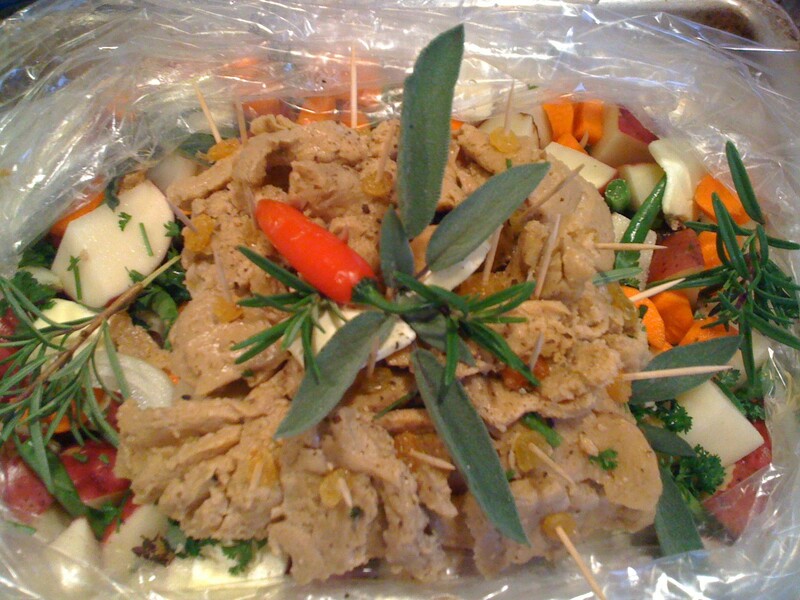 I use a traditional roasting bag to place a bed of stewing vegetables around the Veggie Turkey. The kids join in the fun by harvesting the fresh herbs from the garden–parsley. sage, rosemary and thyme…(you should be hearing a Simon and Garfunkel tune in your head at this point.) I place the two roasts next to one another and attach the “dark meat” Seiten by toothpicks to the roasts. I add a dried cranberry to the end of each toothpick for color and flavor–golden raisins work too. We place the fresh herbs over the entire roast and put it in the oven about 1 hour before we plan to eat. The children all dance around the oven window with the light on singing, “The turkey’s in the oven! The turkey’s in the oven!” My kids know this is not a real turkey of course, but it connects them to the fun of a “normal” American holiday experience. 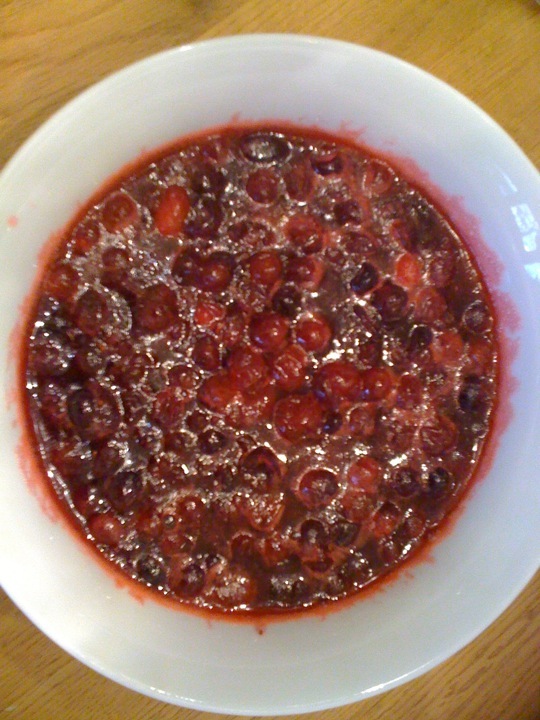 The kids make homemade cranberry sauce. The kids take the bag of fresh cranberries and follow the simple instructions for making fresh cranberry sauce–it really is so easy a child old enough to be supervised at the stove can make it! All you add is sugar, water, and the cranberries. Count Your Thanksgiving Blessings We take the time to set the table with our best plates using a table cloth and napkins. If we don’t have fresh flowers, we pick pine cones from outside and set them in the middle of the table. Once everyone is seated we take a few moments to breathe deeply. 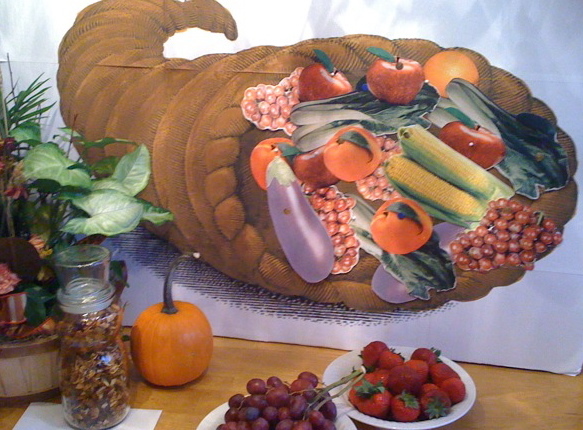 Last year I had a cornucopia made and veggie printouts set at each place setting. I have used colorful turkey cutouts as well. Place them in the bowls in front of each guest with a crayon or pencil. Every can takes a few minutes to write down what they are thankful for, or how God has blessed them this past year. When we are ready, we go around the room giving each person a chance to share what they wrote on their cards. We most love to hear what the kids have to say–often the most profound things. If you make a cornucopia, you can pin the cards on it filling with it with Thanksgiving blessings. We then offer our prayers to God for the feast and dig in! Eat a Healthy Feast for Lunch Plan to eat your big meal at lunch, you won’t over eat as much if you aren’t over hungry. Begin the meal with a wonderful soup–like creamy broccoli made with potatoes and fat-free milk. Serve a baby greens salad with strawberries along with all the traditional fixings. 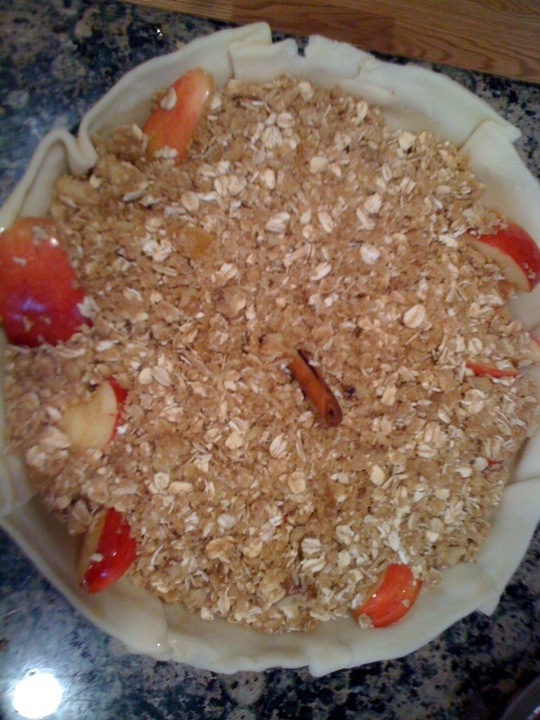 Make a homemade dutch apple pie that is mostly apples made with whole grains and sweetened with organic brown sugar. We finish our meal with pie and chai–spiced Indian tea. You don’t have to worry about overloading on carbs when you share such a healthy feast with friends & family. Play Football Outside We don’t watch football on TV all afternoon–maybe a quarter or two. Instead, we all put on our favorite sweatshirts and go outside and play touch football– kids and adults all running around in the front yard laughing and having the time of our lives. So that’s it. That’s what my kids love about our Vegetarian Thanksgiving Feast: the Macy’s Thanksgiving Day Parade, Counting our Blessings, Veggie Turkey, dinner with friends, and crazy fun family football out on the lawn. So this year, don’t be afraid to invite a vegetarian or two to your festivities. This week, when you are planning your Thanksgiving, eat early, add some more vegetarian recipes to your meal, plan to be active during the day, and include the children in all you do and you will have the best Thanksgiving ever too! Looks like she’s found a way around worrying about thawing it, after all! Blessings to you and your family, Tanya! Was thinking of you and your family during Thanksgiving. We have been blessed to have enjoyed a vegetarian Thanksgiving meal with you all, the first year we landed in Munster and it was delicious. Hope you had a wonderful thanksgiving.